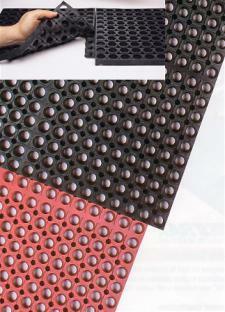 Anti-fatigue mats can help reduce the chances of falls. Falls can be debilitating for people, depending on their age, current health status and how hard they fall or what they land on. Raising awareness of fall hazards on the premise should be the responsibility of every building manager, and making adjustments to help prevent those falls, such as adding anti-fatigue mats to help add extra traction, can be positive steps. According to My Fox 8, there are a lot of preventative measures you can take to reduce the chances of falls in your building. Always make sure pathways are clear of any potential tripping hazards, and ensure that mats stay firmly on the ground, so they don’t potentially trip anyone as they walk by. Additionally, the source suggests keeping all major pathways well-lit, so passersby can clearly see the path ahead of them, and can avoid any needless slips or trips. If people experience a fall while in your building, particularly if they are an employee, you could be liable to pay compensation. According to the Occupational Safety and Health Administration, loss in productivity, paying for insurance claims and paying for training for a replacement worker are all costly consequences that could affect your bottom line if someone is injured on the premise.